A Photo Essay is a series of images telling a story, where the images does not have to be presented in a set order. Six photos to create the photo essay itself. One of the images has to have a natural light source, the remaining five is optional (studio lighting or natural lighting). Additionally, you shall take a picture of an object that is tied to the model you chose. The image has to be black and white, and it also has to be a studio photography. This photo will be the front page of the photo essay, and will not be a part of the photo series itself. Images can be edited and manipulated in Adobe Photoshop. Yay and HURRAY – it’s a photo assignment! A photo-essay can be a tool to tell a story. I decided to focus on contrast in this mandatory hand-in. A contrast in personality that is. My idea was to shoot a harder and a softer side of my model. My model is a biker, and a dad, so this became a natural theme. 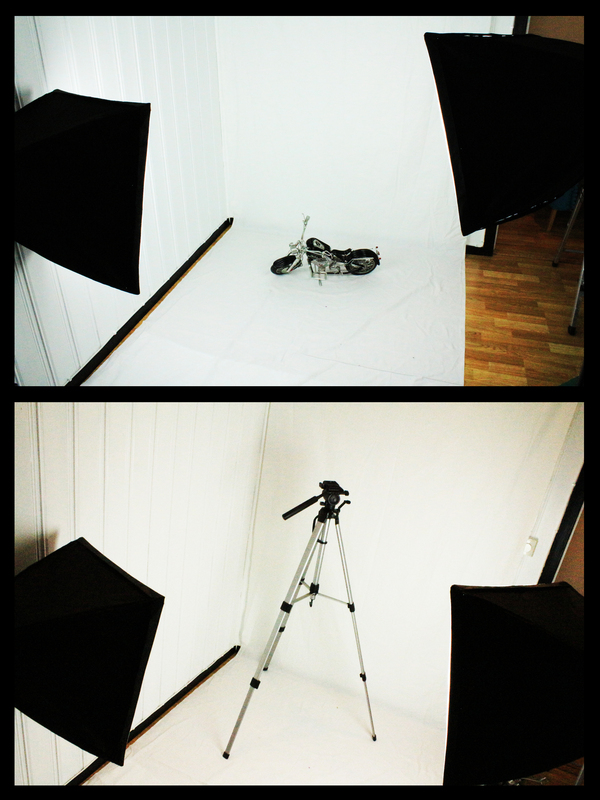 Two soft boxes (250W each bulb, which is quite weak for a soft box). Canon EOS 650D, and I’ve just used the standard lens 18mm-55mm. Outdoors in natural light, I have just used my camera. I wish the room had enough space for a three point lighting set up. this way, I imagine the photos I’ve taken could have had a bit more of a dimensional depth. However, there was no room at all. 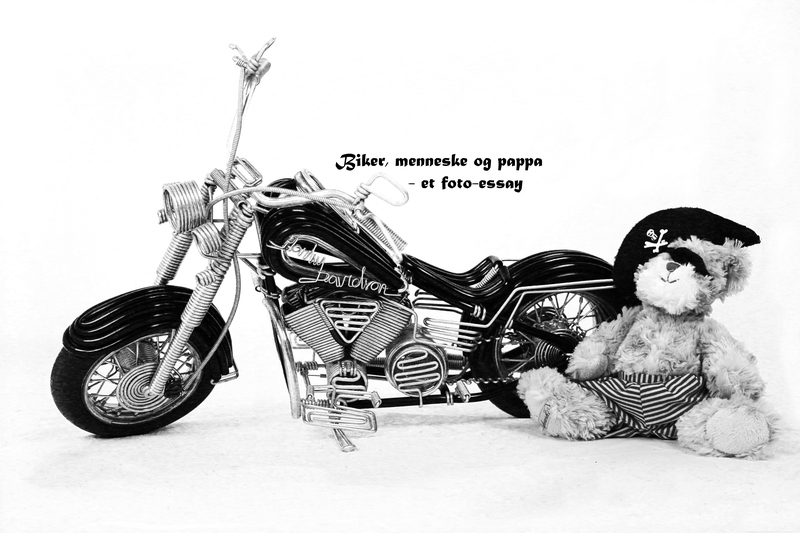 The miniature Harley Davidson represents the models passion for bikes, and the teddy bear represents his contrast side which is softer. Photoshop was used to crop, and make the image black and white. Both light and contrast has been adjusted to a higher level. f/4.5 – Exp. 1/400 – ISO 100 – 18 mm focal length. Image is taken outdoors in natural lighting. 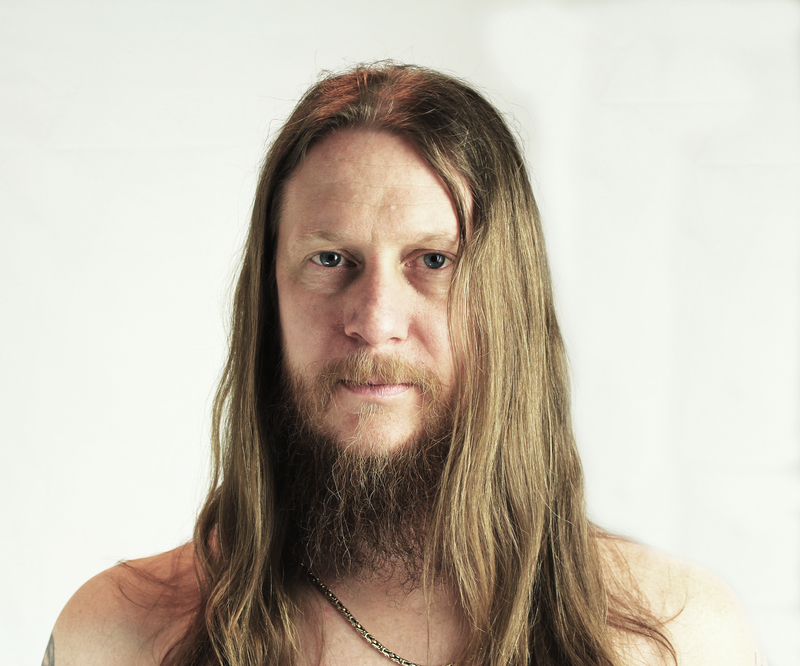 The idea was to create an image that was not a direct head shot. Image has been made black and white in Photoshop, to make the image a bit harder. Therefore, I’ve also adjusted the contrast to make it harder, and also adjusted gamma correction and offset. The model is wearing his color which is the vest of his biker club. I decided that this image should have a hard contrast in color, to make it a bit rougher. The contrast and light have been changed to a higher value in Photoshop. The image has also been cropped to make it a bit more symmetrical. I’ve also tried to adjust the yellow tone in the image, which has probably appeared as I forgot to turn of the roof light (!!! d’oh!!!). However, as you can see, I wasn’t all successful. Image is taken outdoors in natural light. It was quite cloudy. 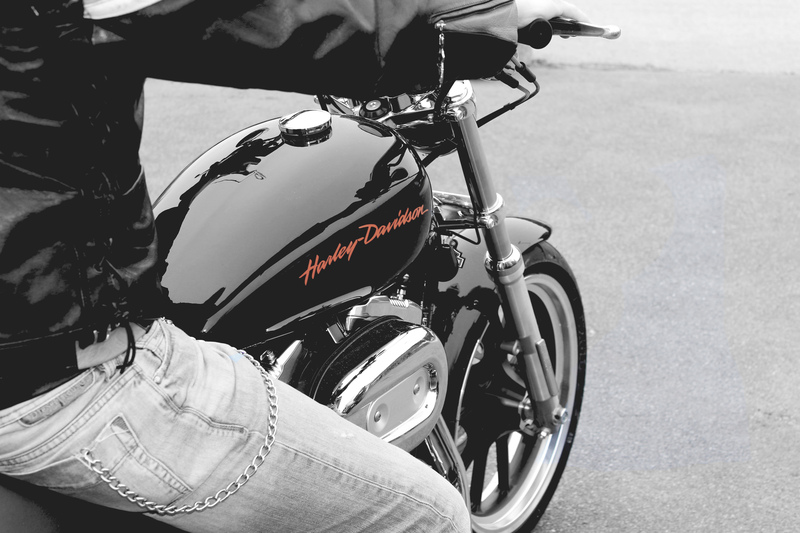 I’ve made the image black and white, but I’ve isolated the color on the Harley logo on the bike. From there on, I enhanced the color on the logo, adjusted the contrast to a higher value, and the light to a lower value. Again, this was to make the image a bit harder. Also, as a bit of a creative touch – I didn’t want the model to show face in all the images. To isolate one color in Photoshop, there is a various of different methods. This studio image has been kept in color. Not all photo essays has to have a head shot, however, I wanted to try one in mine. The focus has been made on the models eyes. I wanted a soft expression, so I have adjusted the light and contrast to a bit of a higher value, and afterwards the saturation has been lowered. The eye is supposed to mirror a humans soul, right? Well, I wanted one in this style in my photo essay, as part of the softer contrast. 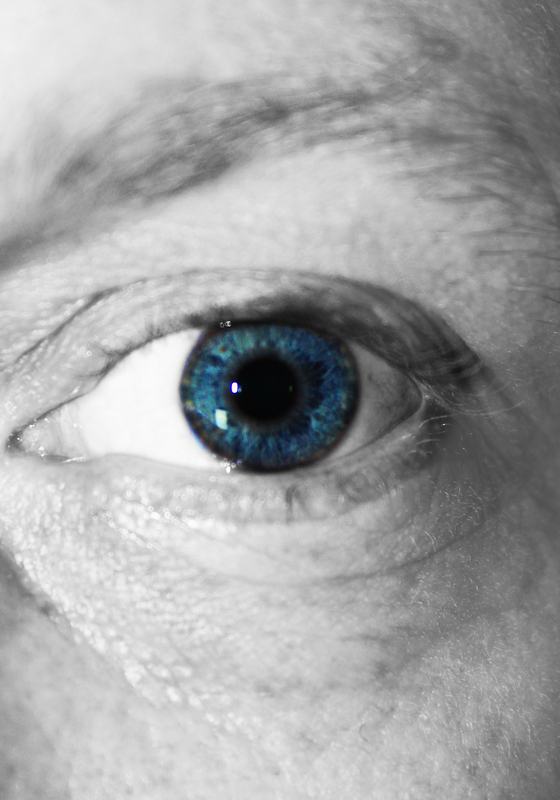 I isolated the blue color of the model’s eye. The blue tone creates a certain calmness, and is also a part of making the image soft. Contrast has been lowered, light has been adjusted to a higher value. This is probably the image I am most pleased with. It’s been kept in color, and few adjustments has been made. In Photoshop, I’ve changed the contrast and the light to a higher value, and I’ve adjusted the offset so that the image gets that soft smokey feel to it. The baby was placed sideways on purpose, so that the main model is more in focus. The image gives you a soft warm and loving feel to it. I can also add that I haven’t used flash in any of the images, as I didn’t feel the need. The studio images has been taken with the soft boxes pointing at the model in a 45 degree from each side at all times. All in all, I am happy with the result, and pleased with the experience of the whole process. It’s quite important to plan in advance of a photo-shoot – as it makes the process more efficient. So that’s it – mandatory hand-in 7 completed. A well deserved weekend ahead. This entry was posted in Mandatory hand-ins, Week 20 - Studio Potography, Week 21 - Photo Essay and Photo Editing. Bookmark the permalink.